Yes, lowering the boiler makes a big difference in appearance. I did that with one of my MDC 2-8-0�s. That is some great progress Andre! Must be off to bed. Will comment more fully tomorrow! When the time comes to get "serious" about assembling some locomotives, I think one of my first will be an ES Rwy #1 2-8-0 look-alike. Biggest challenges will be chopping up a new MDC OT boiler to extract the aft portion of the cast-in weight (then glue the parts all back together), and shortening the smoke box. (I've never done that on an MDC OT boiler before!) It will consume two cabs in order to get the taller "Pittsburg" cab look. Oh, and I'll need a longer pilot, oh yes, and cut off, file/sand smooth, and install fluted domes, and... whew. Maybe I need to pick a simpler project for my first one. SO... in spite of giving up Colorado, I still have the potential of modeling some mighty nice scenes on the layout, and in view of the track plan, much more railroading than I was going to have with my Colorado theme. As always I�m amazed of all the nice photos and pictures you post! Must be quite a large collection you have. Anyhow its been great reading through your thoughts on Ozark railroading and it feels like you have come home in your model railroading choice. No pun:-) One of the great things seeing the photos is apart from being from back in the days also shows beautiful rural areas of the US. I have been following along for quite some while now on History channel the American Pickers show. One of the great aspects of that show is one get to see so much of rural America. Makes me want to take a year off get a flight to the US rent a Motorcycle and go exploring. That was me rambling. I like what you have done and is planning to do on the MDC locos. It really looks nice with the lowered boiler. Well keep it coming Andre, I most certainly enjoy reading your thread. "As always I�m amazed of all the nice photos and pictures you post! Must be quite a large collection you have." Well I'm glad you enjoy them. I enjoy sharing pics, prosing, and what have you. This forum is my "go to" place for things TOC19. As for photos: With the advent of phones being capable of digital imagery, my folders grow regularly! I especially enjoy taking pictures when I'm out riding my dual sport motorcycle in the mountains, and such things as that. "Anyhow its been great reading through your thoughts on Ozark railroading and it feels like you have come home in your model railroading choice. No pun "
Well I'm glad you also enjoy my ramblings concerning my model railroading sojourn. I do feel a sense of "home" in regards to modeling the Ozarks. "One of the great things seeing the photos is apart from being from back in the days also shows beautiful rural areas of the US." In the picture above, that's the Buffalo River meandering through the scene, and its bluffs in the distance, with a camp ground on the left. "Makes me want to take a year off get a flight to the US rent a Motorcycle and go exploring. That was me rambling." "I like what you have done and is planning to do on the MDC locos. It really looks nice with the lowered boiler." Thanks again for saying so! In the past, I lowered all the MDC's I built, or was working on. The "as kitted" tall boiler isn't to my liking. Like I mentioned previously, I may retain ONE tall boiler 2-8-0 to represent one of the "newest" locomotives of my Ozark line... but only one is foreseen. "Well keep it coming Andre, I most certainly enjoy reading your thread. Thanks again for letting me know you enjoy my on-going TOC19 odyssey. Like I said, I like to share via the typed/visual medium... so I'm sure there will be more of it as time moves along! Spent a lot of my day out in my building. I started by taking a detailed inventory just what all MDC engine items I have on hand, and what state they're to. When all finished, it was one of those "good news/bad news" situations. * I have a couple powered and completed chassis that can be used when needed to make a complete locomotive, and some other rolling frames that need small things accomplished and they, too, can be used for an engine project. * I have a used 51" 2-6-0 (kind of rough) and some other assorted rolling frame possibilities. I only have ONE complete MDC kit. Of the three MDC kit boxes I had stacked on my shelves, it appears I've already raided two of them for drivers and other essential parts. However, even though I don't have as many complete kits as I thought, in all, it was a very beneficial day. Thinking again about heading off to the Ozarks. This time it would be this coming Thursday. Supposed to be decent weather (finally!). In Winslow today it was supposed to had a chill factor of 5 degrees F! If I go, at this point I intend stay in proximity to the old Frisco's line, and explore some old haunts that I haven't been able to enjoy in well over a decade. For lunch, I will find a small "Ma & Pa" eating joint and have me some good ol' Ozark home cookin'! This is insane. Last month the old AHM rural depot model wouldn't sell on eBay in the $5 -$9 range. Now that I'm looking for them, look at what sellers are trying to get for them today! This morning I saw one for $19.50 + $7.85 shipping, and another listing for $29.00 + $8.98 shipping. Almost makes me wonder if there isn't some type of algorithm that eBay employs based on searches that helps the seller by boosting the price or something! There's simply no way in #$*@ I'm going to pay $29 PLUS 8.98 for shipping for a .99 depot that needs lots of work to even be "acceptable". Okay... mini-rant over. Carry on. The depot model you showed above needs window mullions thinned down, a casting error fixed, and the electric head scraped off, this task requiring a home-made tool. At what point do you decide scratchbuilding is a better idea? In an evening you can have the walls with openings cut out. Before you assemble everything you can paint walls and castings to get a two-color paint scheme with perfect color separation. Plus, you could lengthen or shorten the depots� footprint for larger and smaller towns while maintaining a company look. 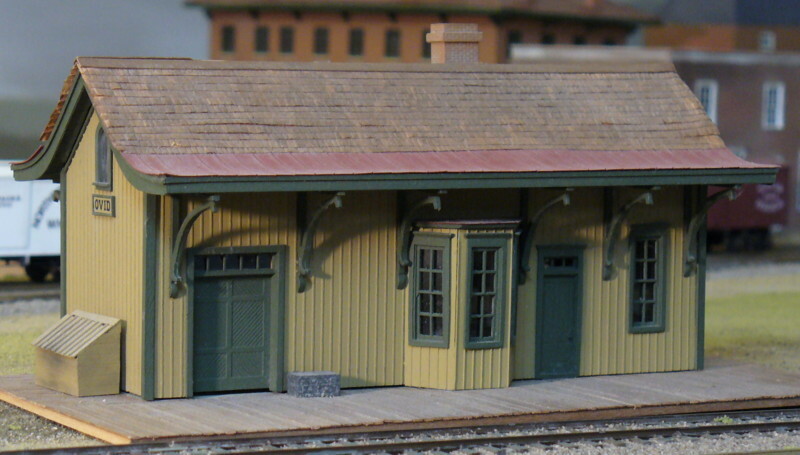 I know, I�m being a little out there, but this is exactly the point at which I decided I would rather scratchbuild a look-alike than modify the AHM depot I had. Perhaps that might have been the best bet cost wise, IF I would have started early-on building. Right now, I'm in too deep to change boats. I have two that are essentially ready for the layout (1960s era), one kit on hand, and three in transit. (I snagged a different one than those linked above later today via an accepted offer.) SO, this one I purchased today does it. Once all have arrived, I'll have enough of them (six) to cover the proposed locations for them, both era's. Thought I'd take a look at that used MDC 51" driver 2-6-0 today. Wow... what a pile of junk. About the only things I was actually able to salvage for reuse were the drivers, cylinders, rods, and some small parts. The frame has had the axle slots wallowed out (by filing, or by wear? ), the boiler has broken places on it, the cab (I think) is salvageable, but has its issues, too. The model was really, really rough. However, the added drivers, along with one I had on hand, have allowed me to make up another complete 2-8-0 rolling frame. SO, all was not lost. Oh, and I'll use its junk boiler to experiment with to see if I can come up with a way to shorten the smoke box on these MDC boilers w/integral cast-in weights. Been at it out in my building. Turned a sow's ear into a purse. I mentioned above that a couple years ago I purchased a used (assembled) MDC Old Timer w/51" drivers for a song off eBay. During my inventory session, and I got up close and personal with it, it was REALLY bad. The modeler must have been a real klutz to inflict so much wear n' tear, and just plain damage on it. BUT... I did get 3 MDC OT 51" drivers out of the deal and some other usable small parts. So, having found an MDC OT 51" blind in my Athearn box marked "Drivers", armed with that usable set drivers, today I finished getting another OT 2-8-0 frame/mechanism put together. This includes all the filing and fitting to get things working. I now have a complete MDC 51" OT driver 2-8-0 ready for when it comes its turn to be fine tuned and fitted with a boiler/cab/etc. The passenger engines of the Ozark & Southern railroad are now equipped with the latest air pumping devices. This will allow the use of the new "automatic air brake" systems that are beginning to appear on railroads all over this great Nation. Photograph supplied by the Ozark & Southern's Company Photographer. Passengers availing themselves of the O&S in order to transport through the O&S's Ozark Subdivision will no longer have to clench the backs of the seats in front of them in wide eyed fear as the train falls perilously down the steep and crooked grades of the Ozark & Southern. We're sure there will be a collective sigh of relief from all concerned upon learning of the installation of air brakes in the passenger engines and passenger cars. 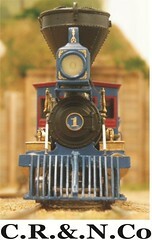 Engineer John "High Ball" Hall was reputed to have said that he preferred the days of hand brakes, for he enjoyed the challenge of getting such trains safely down the multitude of grades and tight curves of the Ozark & Southern. Hall added "when yer engine's a rockin' and rattlin' down those grades, with them cars a'followin' 'ya', and ye round a curve on two wheels... it's just downright excitin'. I'm a'gonna miss that, yes sir, I'm a'gonna miss that. I just may have to go back to freight service... at least until they's equipped with that new air contraption. I ain't piled up too many of 'em, so's I don't see the problem." But progress marches onward. This step is but the first step of the Ozark & Southern to bring itself up with the times. Watch the Ozark Mountain Air for more news of such progress on the O&S. So there you have from an old news paper clipping! All four of my my DCC/Sound B-mann NT 4-4-0's are now so equipped. Later on when the repaint/detail stage is reached for them, then piping can be run and other niceties, but for now this will do. Have a web piece about putting sound in old Roundhouse Steamers. What a novel way of dealing with that weighted MDC tender frame... replace it! Way "back when" in my PFM2 days, I would band saw the weight portion, leaving the floor/frame. Was going to do that again for DCC/Sound installation... but now you've got me rethinking that. IF all goes as planned, sometime this week I will head off to Fort Smith to pick up a pair of folding saw horses and L brackets. Then it will be off to the lumber yard to pick up some A-C 1/2" plywood. (I will try to find/order some Homasote, too.) IF this is accomplished, by week's end I should be ready to cut some plywood and install the lower shelf for the lower stage yard!!! WOW... the time for layout construction is arriving! * A pair of fold-able saw horses are on order from Home Depot and will be delivered to my doorstep "soon". Two sheets of 1/2" A-C yellow pine plywood are ON HAND and waiting! These two sheets should get the lower stage and the first town in place. * Picked up a bunch of L-brackets for the staging shelves. * Inquired about ordering Homasote at the regional outfit that offers such. Downside to the Homasote: Each order will require an additional $18-$20 added for the protective sheets of MDF. (The Homasote will be sandwiched between.) SO... I'm trying to figure out how many sheets I'll need to get almost to the end of construction. Unfortunately, the Homasote sheets will have to be stored in my garage and taken to the out building 1-2 sheets at a time. Materials storage is LIMITED within the out building. I'll likely order 6 sheets of Homasote before week's end. That will be $228 worth of Homasote, including two sheets of MDF I don't have a use for. Ah well, it IS what it is! Alright! Construction can't be far off.